I am in a pretty good place right now. Looking outside at one of those typical damp and grey November days, I am unusually content and relaxed. The last few weeks have seen me investing my time and throwing my energy into another hard Peak sport route. Devolution. Last weekend saw the conclusion of this mini saga and we are still living off the psyche that a completed project brings. 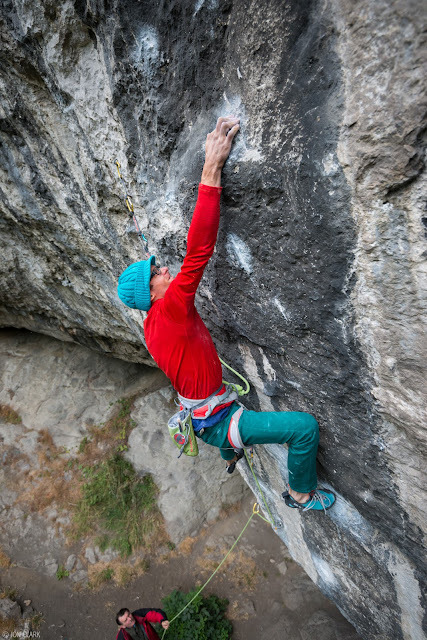 For those not entirely clued up on their Raven Tor trivia, Devolution climbs the lower crux section of the mega classic, rarely repeated, Jerry Moffatt route 'Evolution', before scamping off rightwards via some delicate crimping into the headwall of Chimes of Freedom. It is of course a cop out in many ways but still provides some seriously hard climbing and if Evo itself is considered 8c+ these days then this has surely got to be 8c in its own right. Either way, it is still pretty stiff! I figured on giving it a bash as the meat of the route is still the lower section of Evo and it would provide a good stepping stone to trying this afterwards. It started to get a little frustrating at times, as redpointing does. I kept blowing the big lock-off move to the break but it was mostly due to my finger splitting open which meant my attempts were always limited. I had to have quite a few days off from climbing to make sure my skin was in the best shape it could be for the next session. Forced down time is seriously not my thing. I am not sure what is worse. Falling off after doing 30+ moves or falling after about 3. On the one hand doing a tonne of moves and hard climbing is great for improving and maintaining fitness but then you fall over and over and your heart breaks. Doing 3 moves and falling just gets you angry, in a whole different way. It feels sometimes as if you are just going backwards and you start to think you are getting weaker. This is all in the head of course but that is half the battle. Head games. Jedi mind tricks so to speak. I have climbed Chimes literally hundreds of times. To the point where I could do the thing in my sleep, with a cold and dosed up on calpol. Baby Chimes was my first 8a and the full line is probably one of my favourite routes in the area. 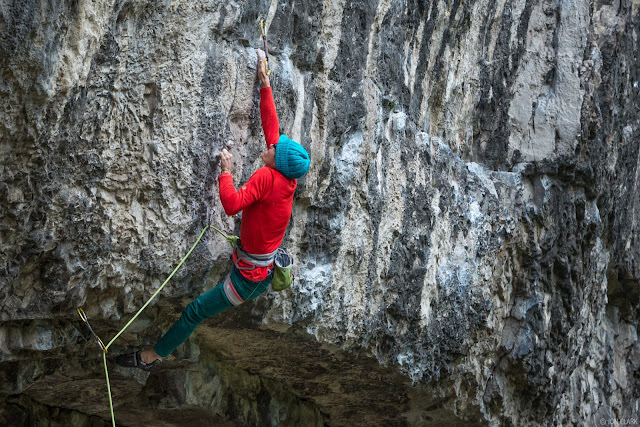 I always knew that once at this point, from the ground it would be totally fine from here on in, but I also always knew that it would probably be rather nerve-racking climbing my way to the belay. After finally pulling through the start and making that breakthrough, to blow it on some silly moves done a million times before was not even worth thinking about. However the mind is a hard thing to control. The minute I left the resting jugs on the headwall I felt a jibbering wreck! My brain was going berzerk, already in the future, trying to project me into post send glory. It felt almost impossible to switch off, relax and focus on the moves ahead. A simple moment of madness. A silly foot misplacement on the last move almost could have had me off. Thankfully it mattered not and the job was sealed. But it sure gave us a fright. Now this one is out of the way I am psyched to get stuck into the main event. Who knows if it will go this year, as the season is rapidly drawing to a close. Hopefully there are a few weeks yet so at least if nothing else I will be able to lay the ground work for a full blown attack at it next spring. Anyway I'm off to build a bonfire and make a pot of chili.